Fall is a wonderful time to gather with friends and family. 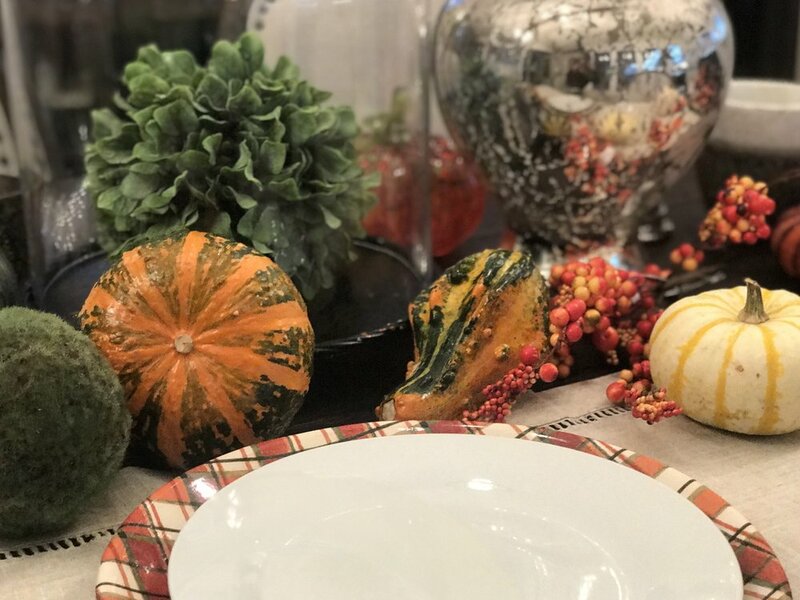 Whether you are having a small outdoor get together or a large family dinner, we have some tips on how to decorate and prepare for welcoming guests this fall season. Guests will get their first impression from your front porch when they arrive at your house. This means that it should look welcoming and homey. We love using a cute seasonal doormat accompanied by various sizes of pumpkins and gourds. Plant your pots with a mix of kale or cabbage, grasses, mums, and other bright annuals. To your pot you can add an extra touch by including small pumpkins and some tall curly willow branches or cornstalks. Create an arrangement for your main dining table where your guests will be gathered. You can fill glass vases with flowers from your garden or the farmers market. Surrounding the vases you can add small pumpkins or gourds to make it more fall themed. Glass pumpkins are pretty items to add to the real pumpkins in the display. If you want to add even more, fall inspired picks, branches/twigs, and pinecones add an extra festive touch. Whether you’re having an indoor or outdoor get together, make the table fit the occasion. If it is an outdoor event you may want to use melamine plates and plastic cups. Find linens that fit the setting and add some leaves or branches from your yard to utilize the gorgeous natural touch to your table. To keep guests feeling at home when dinner is over, keep fall candles lit around the house. This will keep the cozy ambience while you continue to enjoy your guests. Diffusers are also a great way to fill your house with fragrance if you are looking for a flame free option. Some of our favorite fall candles are Thymes Heirlūm Pumpkin, Thymes Simmered Cider, and Votivo Red Currant.